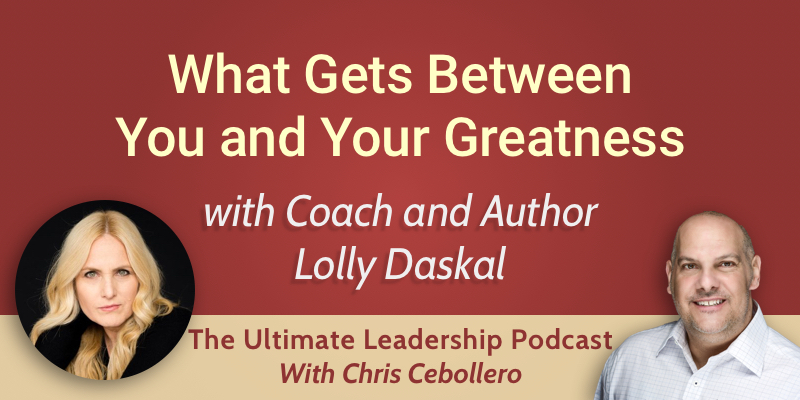 My guest this week is leadership coach and author Lolly Daskal. Lolly shares with us what are the seven archetypes that exist in all of us, why they are important, and how they connect to our best version of ourselves. Lolly’s book, The Leadership Gap: What Gets Between You and Your Greatness, is not just a leadership book, it’s also a life book, because it’s based on psychology and human development. Human development makes us into leaders. She talks about leadership as the core fundamental of human behavior. Within all of us, there is a polarity of character. For everything that is great about us, there is a gap. For every strength, there is a weakness. In times of stress, even though we have the qualities of greatness and strength, we always go to the gap. The book opens up with seven archetypes. These are archetypes that Lolly has seen within not only leaders, but in every person she has ever encountered. The first archetype is the rebel. The rebel wants to make an impact and a difference. The strength to be able to do that is confidence, and we all want to have confidence so that we can be the rebel. But 99% of us who are high-achieving individuals suffer from the impostor syndrome. The impostor has self-doubt. We have to know what to do when we bump into our gap. If you bump into the impostor, you have to understand where this comes from. The impostor syndrome comes from comparing ourselves with others. When we do our job, we can’t just be impulsive, we have to be mindful, intentional. Lolly always has small conversations with herself almost like to keep her in check. That’s how we can grow and become the best versions of ourselves. How can we recognize a gap? Awareness is the first form of learning. Once we know that these seven archetypes do exist within us, we can change our mindset. Each one of us wants to have greatness in their lives. We all want to leave our mark. But we want to do it in a way that makes a difference. The way to do that is to constantly learn who we are on the inside. To lead outwardly, you first must learn to lead from within. Another archetype is the navigator. Most of the people listening to this podcast are very smart, practical, pragmatic, and successful. But when someone comes to them with a problem, they tell people what to do. Instead of being navigators, they become fixers. When we should up as a fixer, most of the people think of us as being arrogant. When someone comes to you with a problem, be the navigator: listen and coach them, don’t try to fix them. This is a game-changer. We are not one archetype or another, we are all of them. These archetypes are based on virtues, and they give you an inner core GPS. They give you the opportunity to find out in each situation which person you need to be in order to be great. If you don’t pick an archetype, you will end up leading from your gaps. The book is like a blueprint on how to be the best version of ourselves. Because it’s based on virtues, it’s about confidence, loyalty, trust, integrity. If you become these archetypes and you are always conscious of leading from your greatness instead of leading from your gaps, you will be known as an individual who is trustworthy, reliable, and responsible. The next time you bump into someone who isn’t living up to their potential, offer them help. The next time someone comes to you with a problem, listen to them. The next time someone says “This is how you need to do it”, become the explorer. The book teaches you what to do in every situation. Greatness is not something reserved for just a few. It can be achieved by every single person. You just have to choose it.